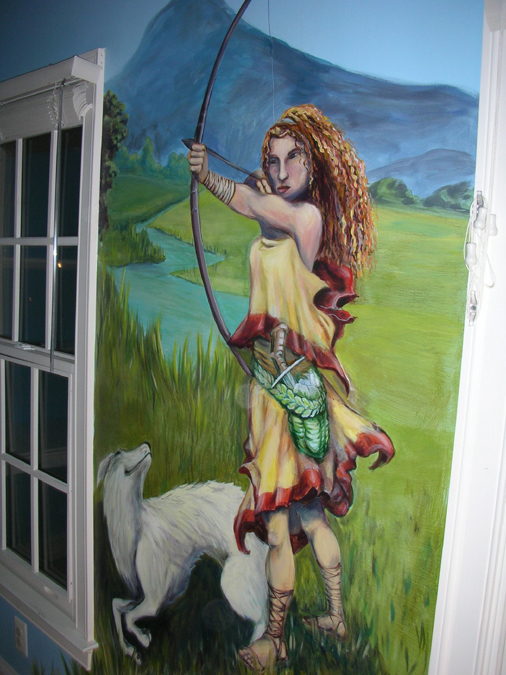 Murals add value, significance and a sense of personal expression to your home like no other art form, and have since the earliest humans decorated their cave dwellings with nothing but their hands and a bit of powdered pigment. BB Murals will work closely with you, the client, to create an unforgettable concept tailored to the decor and style of your home. One of Mrs. Letke's daughter's loves pandas. So while she was away at camp, they surprised her by commissioning me to fill her room with these lovable creatures set in a bamboo forest. 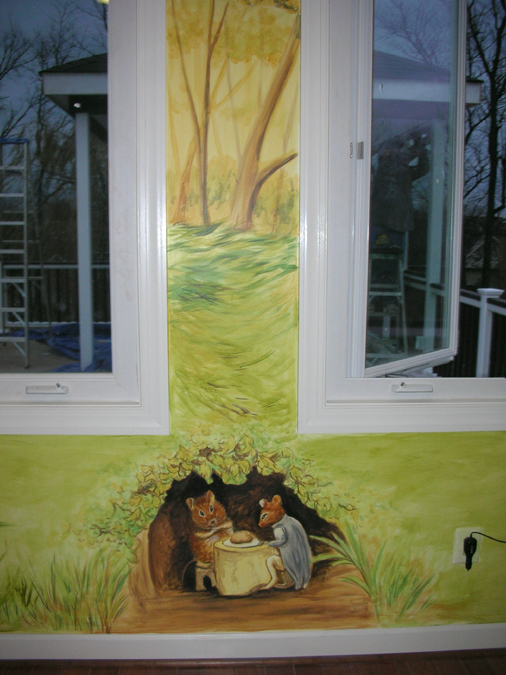 The mural stops around waist height to make room for the furniture, bed & desk. This was a two day project. 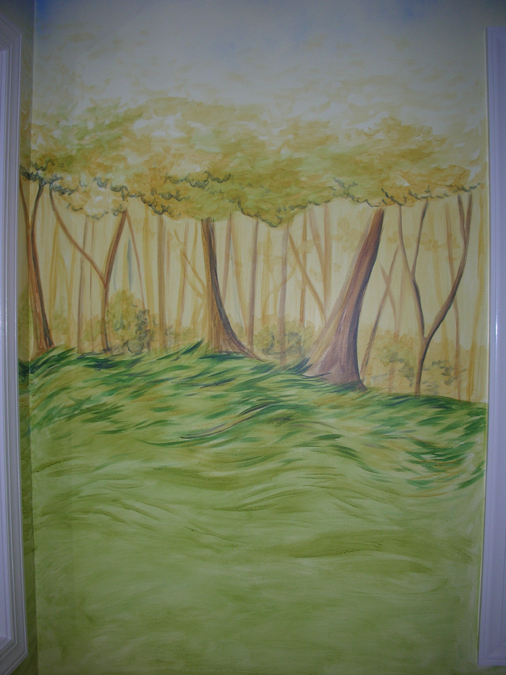 An accent mural for Mrs. Cartwright's pool area. My son Jacob accompanied me on this 3 hour job and had a chance to play in the pool while I painted. Mrs. Cartwright was gracious and generous enough to let him enjoy the pool that hot summer day. This farm inspired mural was actually a surprise gift from my friend Greg French to his wife on their anniversary. They own two pet goats and some chickens which they keep in this shed/enclosure near their driveway in the side of their front yard. His wife grew up on a farm and always loved keeping animals. 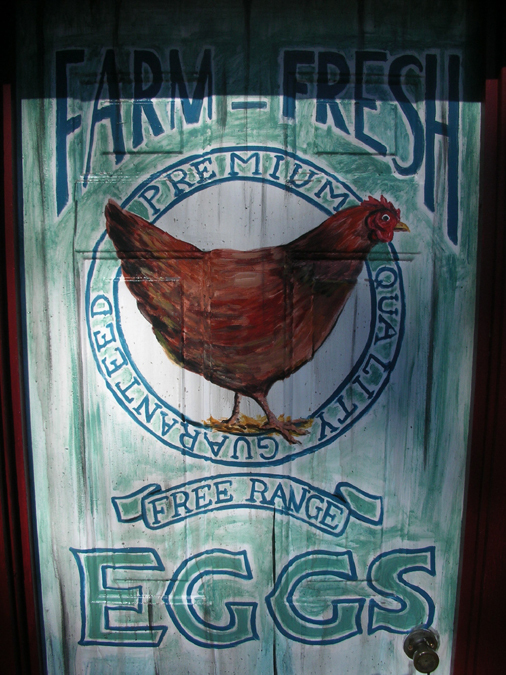 The mural includes a horse peeking out of a trompe l'oeil barn door and a vintage Fresh Eggs sign on the door. I also applied a wash to the wood made to look like aged boards and painted the trim a Colonial Red to match their existing garage. Sharing a workspace with a pair of curious goats was an interesting challenge. A gift to my parents for their retirement home in Sarasota which we affectionately call the Palm House. This two day mural celebrates the beauty of Florida's marshlands and the diversity of the birdlife it harbors. I've included an Egret and Sandhill Crane in the foreground and a few other cranes in the background. This is the largest single baby nursery I've ever seen. 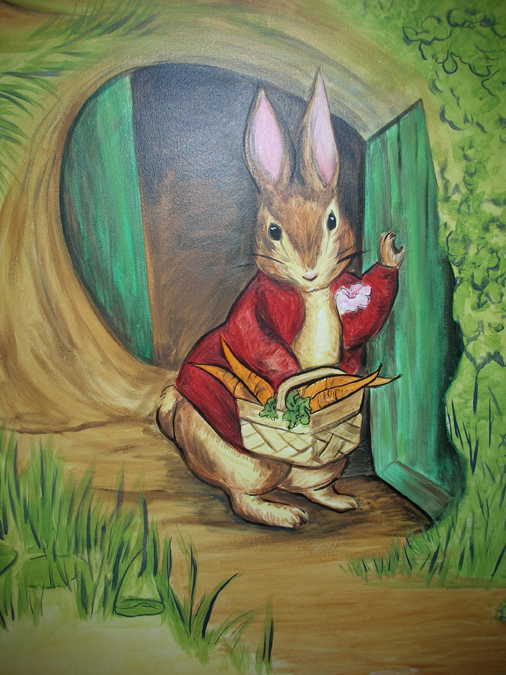 The client, Mrs. Sharmeen requested a Beatrix Potter them from her series on Peter Rabbit. I love to copy other artists because it pushes you out of your comfort zone as an artist. You end up learning quite a bit as you approach line, shape and color in a different way. I painted every inch of this room from walls to ceiling. It was truly an all-encompassing environment. Would love to see it furnished! 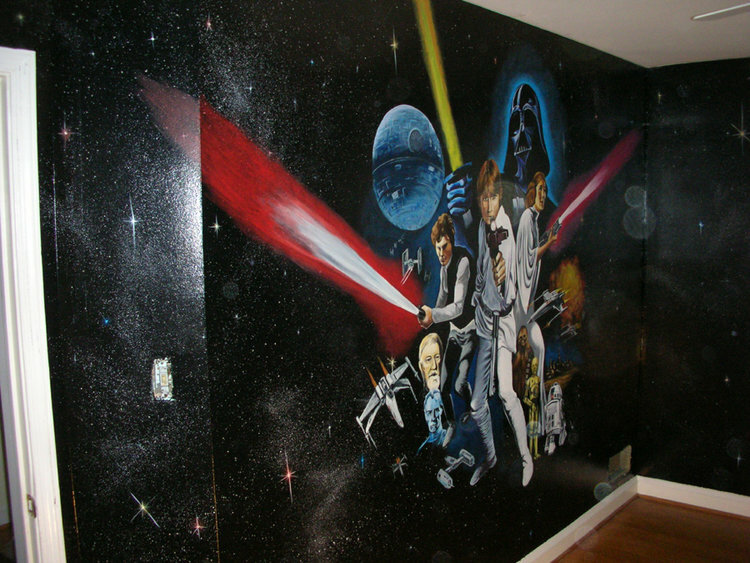 What a joy to adorn a bedroom with hand-painted Star Wars characters! This image is taken from some of the earliest marketing material for the franchise back in '77 and includes all your favorites, but slightly altered, like Darth Vader with a yellow light saber. 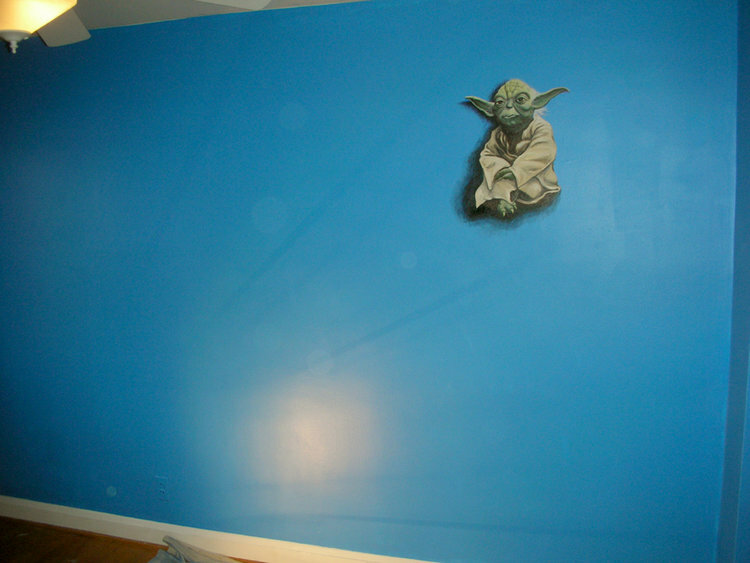 Yoda is positioned hovering because once the painting was complete, a bunk bed was inserted into that corner so that from the top bunk, Yoda would be at eye level. Always thinking about how to please the client! 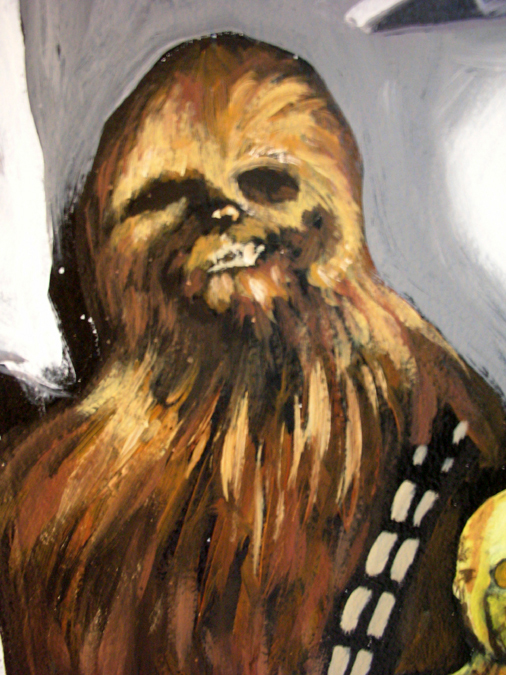 The second mural I've painted for my son Jacob, who, like his father, is a huge Star Wars fan. This mural served as a backdrop for all his Episode 2 Star Wars Lego figures and ships which were strewn across his dresser and hanging from the ceiling. This project was a unique request, at a unique house, and a unique experience as well. During the three days I spent painting at the Konkus residence, I had a constant companion in the form of an African Parrot named Guido. We had some good laughs together as he whistled recognizable music, film and tv tunes all day. 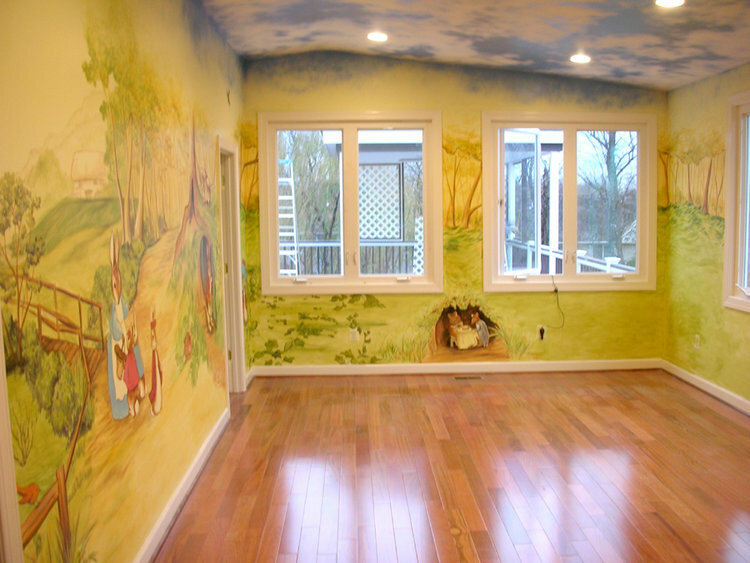 One of several children's rooms that are inspired by Winnie the Pooh's 100 Acre Wood theme. At least the tree resembles that style. 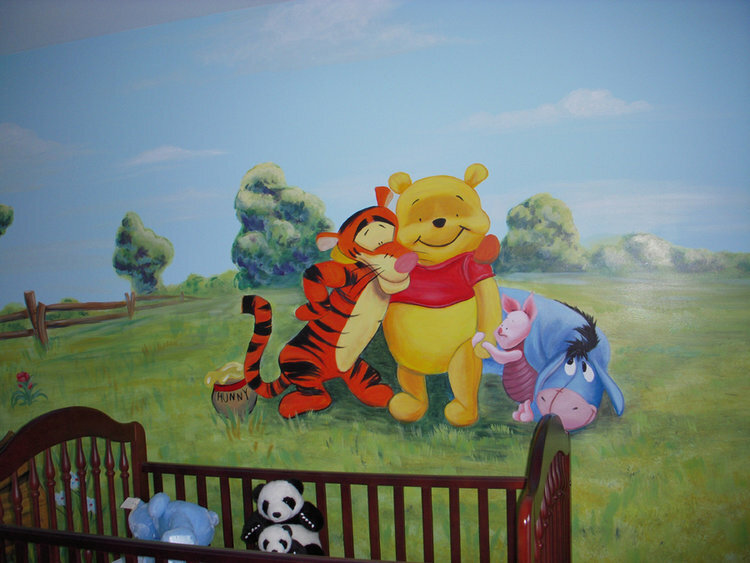 This is one of three murals I painted for the Thaniel children as sort of a package deal, including a Care Bear theme for the eldest daughter and a soccer theme mural for the son. Jeffrey's room. Jeffrey loves Greek and Roman mythology, obviously. Pictured here is Helios the sun god with his four steeds and chariot, Pan playing his reed flute and Artemis the Goddess of Hunting seen often with a doe. With the help of fellow artist Ryan Emge we painted all three murals in three days working 10 hours a day. My daughters room when we first moved to Lutherville. We've painted over it since then but it served its purpose for many years. Another Winnie the Pooh theme. This seems to be a popular choice. Ms. Lande wanted the rustic feel of stone walls in her kitchen without the hassle and expenditure of actual rock facades. She was hoping for a European country kitchen vibe. Besides the stones, I added some cracked plaster and vines to complete the illusion. Just imagine the savory smells pouring out of the kitchen now. I think she will be inspired to cook, using every herb and spice at her disposal! Lanai make-over! 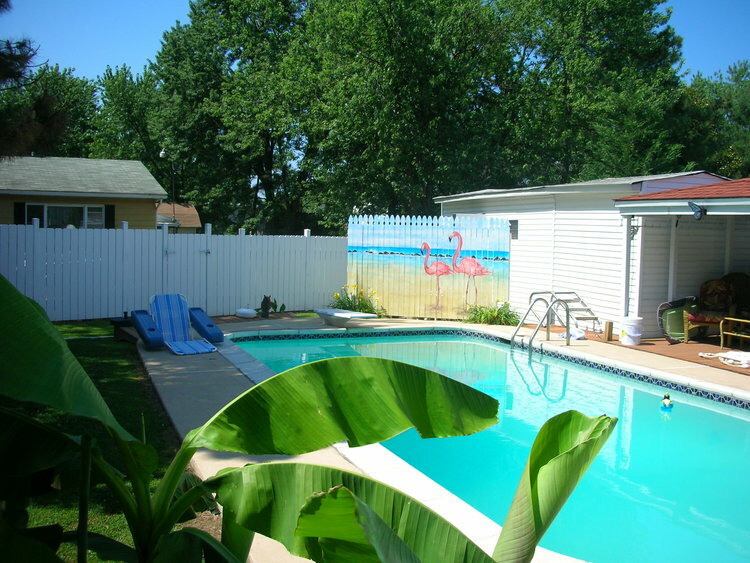 Anita wanted to continue the tropical bird theme in her house onto the walls with a custom designed mural. Some local seamstresses were nice enough to reupholster the seat cushions and pillows for the occasion while we were there. We also repainted the white wicker furniture to a distressed brown and green/gold to match the mural and the rest of the décor. In addition to the lanai, I was commissioned to create a faux finish in the living room and a palm tree accent mural in their guest bathroom. All in all I think I spent two weeks at the Jankovski home bouncing from project to project. This particular mural was painted over three days in 12 hour increments. 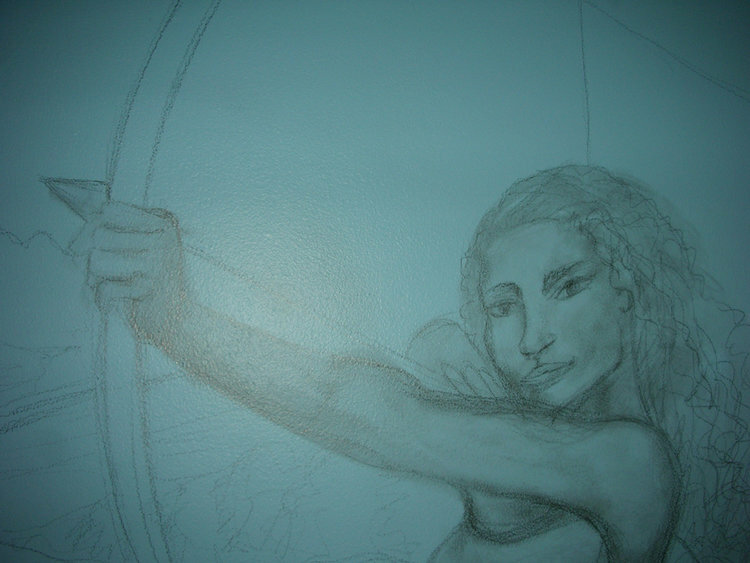 I've never painted so intensively in my life! It offers a view of a Tuscan countryside cut by a long and winding stone pathway seen through a carved marble railing entryway and a trompe l'ioeil niche containing a water maiden marble sculpture. All very warm and inviting, the artwork is located next to the kitchen and will grace the couples dining area.